This week I am taking a virtual trip to my biggest country so far and the second largest country in the world, it is a land of mountains, vast forests and arctic tundras, this week I am taking a look at Canada. The first thing I think of when I think of Canada is the Maple leaf, It has been an important symbol of Canada for many years and it may have first been used as a canadian symbol as early as 1700. In 1965 the leaf was most famously the leaf used on the flag of Canada and has been flown across the country ever since. There are 2 National sports in Canada, the official summer sport is Lacrosse but I decided to make something to do with the official winter sport of Ice Hockey. Now personally I hardly know anything about Ice Hockey, everything I know comes from 2 places, firstly from those few minutes I occasionally see at the various Winter Olympic games (this year I didn't see any). The second place I get to see things about Ice Hockey is from a few facebook friends (mainly Hal) They always say it is exciting to watch, as you can see I have made 2 Hockey Sticks and a puck. The Moose is the largest member of the deer family and can be found all across Canada. In 1897 a Moose was discovered that was an amazing 2.34 m (7 ft 8 in) tall at the shoulders and it had an antler span of just under 2 metres (wow that really is huge). Generally they are calm animals however the females can get dangerous when protecting their young. Finally when it came to making my little canadian character I really only had one choice of what to make, yes it had to be the Canadian Mountie or the Royal Canadian Mounted Police. The Mounties have such an iconic look, they are instantly recognisable with their bright Red Serge tunic and the wonderfully shaped Stetson-type hat, I really do think this is one of the most well known uniforms in the world. Because Canada has 2 official languages (English and French) I shall end this post appropriately. Until next week, Bonne journée! For the second week running I am looking at a requested country, A few weeks ago I was asked by Nicole to take a look at Romania as it was where she was born, so here you go Nicole. Romania was another difficult country to research, I did manage to whittle it down to a few key elements tho. first of all the strange structure on the left is based upon a sculpture by the Romanian artist Constantin Brâncuși, it is entitled Endless Column and it one of 3 sculptures built to commemorate the Romanian heroes of the First World War. Romania is the home of the Danube Delta, the place where the Danube reaches open water (The Black Sea). The Danube delta is a UNESCO World Heritage Site and as you can imagine is home to some wonderful wildlife including Europes largest colony of Pelicans. More than 20,000 pelicans are currently living in Romania and according to a recent census of the birds 19,993, are great white pelicans while 534 are Dalmatian pelicans. While looking into the cuisine of Romania one dish kept coming up, it is the dish of Samale, This is a dish consisting of minced meat with rice, wrapped in either pickled cabbage leaves, I never imagined I would ever be making anything as random as a dish of stuffed cabbage leaves out of balloons but there is a first time for everything. Finally I thought long and hard about what little character to do for Romania, I did look into traditional Romanian dress (which is lovely) however I kept going back to one of the most well known Romanians, Vlad III, prince of Wallachia, AKA Vlad the Impaler and the inspiration for horror legend Count Dracula. The most likely home of the Count is thought to be Castle Bran in Romania's Transylvania, Dracula as we know him however is just a horror legend and the stuff of stories . . . . or is he? I currently have no idea what part of the world I am taking a look at next week, for the first time in this project I have no plans of where I am going to be taking my virtual journey so you will have to wait and see, do you have any suggestions? why not let me know and I can include your country in my series. Until next week - Vă doresc o zi plăcută! Last week I mentioned I would be visiting South America, well I changed my mind, I was going to do this one next week however I brought it forward a week for various reasons. Mainly because this week I am taking my balloon twisting to Spain, Barcelona to be precise, I figured it would be a good idea to actually share my Spanish balloonagraphic in the week I actually go to Spain. I found Spain quite a difficult country, Spain is known for so many different amazing things I found it tricky deciding what to make out of balloons. While researching the country I found a lot of references to lots of well know Spanish artists, Picasso, Salvador Dali, Goya, the list goes on so I figured it would be great to do something related to art, I WAS going to do something that looked like a Picasso painting but I ended up making the paint palette as that covers ALL the artists of Spain. The Spanish are passionate about their football so I thought it would be a good idea to make their national football shirt, plus something that Spain is well known for by us Brits is the wonderful long hot days sunbathing on those glorious sunny beaches. The Traje de flamenca is the traditional dress worn by women to festivals usually in the Andalucia area of Spain, Flamenco dancers will also wear flowers in their hair and that is what my little balloon lay is wearing to represent her country. 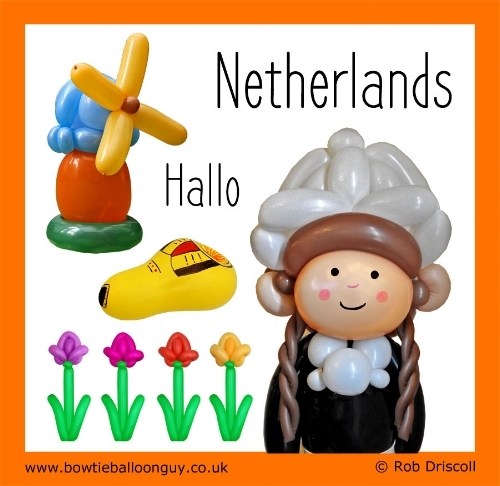 Next week I WILL be taking my first virtual visit to South America on my balloon world tour, so until then, Adios. Hello everyone, This week I am having a look at Japan, the land of the rising sun. I have always wanted to go to Japan, I am sure I will do one day. So first off I wanted to recreate the Japanese Torii, this is a type of gate that is found at the entrance or within a Shinto shrine, it marks the transition from the profane to sacred. Personally I think the most famous Torii is the Itsukushima Shrine, found in the city of Hatsukaichi in Hiroshima Prefecture, at high tide it appears to float on the water. I love the architecture of Japan, there is something so wonderful about the traditional Japanese designs and I just had to include an element from the Japanese Rock garden (or Zen Garden). Rocks are an important part of the Japanese garden and as you can see I have created a small pile of balloon rocks. Every year in spring an incredible natural event sweeps its was across Japan, starting in the far south of the country the cherry trees come to life with their amazing pink blossom, slowly moving north over the spring months the cherry blossoms attract thousands of people to partake in hanami, which literally translates as “looking as flowers” and refers to flower appreciation picnics under the trees. The folding hand fan was invented in Japan and may date back to the 6th century, here I have made a hand fan, they would typically be made from Japanese cypress and paper or silk. Finally I felt I had to make a Geisha, a traditional Japanese female entertainer who would act as a hostess. They have many skills including Japanese classical music and traditional dance, witty games and conversation. I always imagine them performing the Japanese Tea ceremony. I do hope you are enjoying my project, do you have a country you would like to see? Let me know by commenting on this post, it would be great to hear some suggestions. Until next week, sayōnara. Shalom, Mah Ha’Inyanim? This week I am in the country of Israel, the land of milk and honey. The star of David was something I just had to make, I think it was actually my friend Danny who suggested I make this for when I visited Israel and it is lucky that the Star of David is such an easy shape to make with balloons, all it took were 2 balloons, each one with 3 simple twists in them. The next thing I wanted to make was a menorah, a sacred candelabrum with between 5 and 9 branches depending on what it is used for, this one is a 7 branched menorah and should originally be made out of solid gold. According to the Times of Israel "Becoming not only Judaism’s oldest symbol, but also the Western world’s oldest continuously used religious symbol, the menorah once stood in the Holy Temple of Jerusalem. The seven-branched candelabrum (nine-branched for Hanukkah) has been a source of fascination and illumination for Jews, Samaritans, Christians and also Freemasons for three millennia." Below the menorah I have made a diamond, Israel is one of the world's three major centers for polished diamonds, diamond cutting is a traditional Jewish craft going back centuries. At the top left of the picture I have created a balloon version of one of the most familiar buildings in Israel, The Dome of the Rock is an Islamic shrine located on the Temple Mount in the city of Jerusalem. I am not really a religious person however I am always fascinated by religious sites like this. Last but not least we have my little Rabbi, He actually came about by accident, I was trying to make a different character and then suddenly this little chap appeared, a very happy accident. Well that is it for Israel, I found it a difficult country to research and I really didn't want to get anything wrong so apologies if I have made any mistakes with this country. Next week I am off to a land made up of over 6,800 islands. Ssalamū 'lekum, This week I am taking a virtual trip to my first African country, it is Morocco, I have never been to Morocco so it has been very interesting researching it for the project. The first things I made for my photo were the moroccan slippers, when I started researching the country these were one of the first things I discovered and felt I really wanted to have a go at making them. In real life these slippers are often made of leather or covered in fine embroidery and decoration but I have gone for a plain pair. The next thing I made was a Moroccan lamp, I have made mine to have brightly coloured glass, these are often highly decorated and the sides have elaborate shapes and patterns cut into them. The Ship of the desert was an obvious choice and in Morocco the camels are mostly dromedaries (one humped) and are usually owned and domesticated to a certain degree. The Tower I have made is based on the tower from the largest Mosque in Marrakesh, the Koutoubia Mosque. This mosque has been standing for well over 800 years and stands at about 77 metres high. Lastly I have my Moroccan man, when I first started to create my little balloon figures I knew I wanted to make a Fez and this led to a discussion about the origin of this well known hat. I knew it was named after a place and it soon became clear that it is named after the City of Fez in Morocco. Next week I am off to a country whose capital city is home to over 100 Sushi restaurants making it the city with the most sushi restaurants per capita after Tokyo and NYC, it also hosts a rollerblading party every Tuesday night. Buenas tardes a todos, I hope you are all well, This week we are taking a look at Mexico, or as it is officially known The United Mexican States. Mexico has a diverse landscape of mountains, deserts, jungles plus some wonderful beaches on the Pacific and Gulf coasts. One of my favourite traditions is the Mexican holiday of the Day of the Dead, A festival to remember and pray for friends and family members who have died and to help them with their spiritual journey, to honour this event I have included my Day of the Dead Skull. I have always imagined the food in Mexico to be full of flavour and colour, I know that Corn is a major ingredient however I felt that the Chilli was an iconic Mexican food ingredient which I had to include. The Guitar represents the amazing music of the country including the well known Mariachi bands, and with over 1000 different types of Cactus found in the country I felt that a Cactus would be perfect. This week my little balloon man is wearing his Sombrero, the perfect hat to keep him cool and shaded in the intense Mexican heat. Next week I am heading back to Europe to the home of the Grandiosa frozen pizza. Hasta la próxima semana, Adiós. 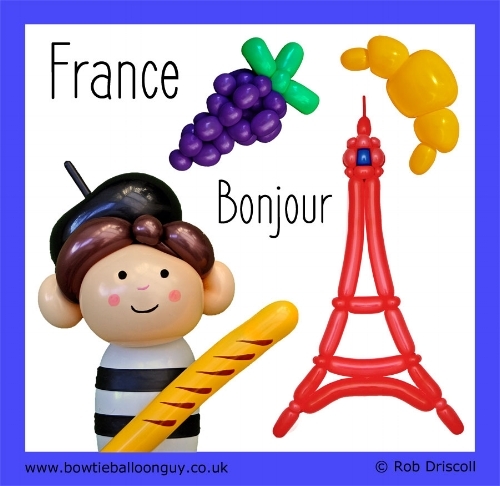 Bonjour and welcome along to my brand new balloon challenge for 2018. For this project I am going to be making a virtual journey around the world visiting a different country each week. For my first week I am starting off fairly local to my home country by visiting our neighbours, France. France is really well known for its fine dining and wine so I felt i needed to include some of these in my picture, as you can see I have the grapes which eventually get turned into wine plus I have included the croissant and baguette. The little man I have made is not wearing the traditional national dress of France, and I must confess that during my many visits to France I have never seen anyone wearing the stereotypical stripy jumper while riding a bicycle, it is however what many people think of when they imagine a Frenchman so that is what I did. Finally I had to include one of the most famous landmarks in all of France, the Eiffel Tower, This marvel of engineering stands in the centre of Paris and has dominated the skyline for 130 years. I made my Eiffel Tower in red so that the complete picture includes the 3 colours from the French flag. Next week I will be travelling a bit further from from my home to a country that is home to the Volcano Rabbit. 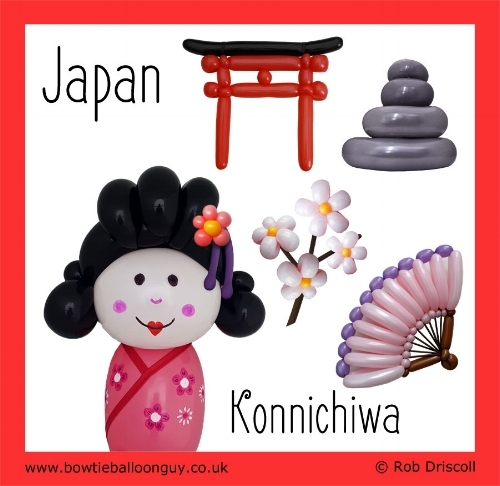 A new balloon project starting on January 2nd 2018, I will be taking a virtual journey around the world visiting a different country each week.